S1E02 A review of the Competitor robot Chaos 2 toy, from the BBC series Robot Wars, produced by Logistix Kids. The team members were George francis, Ian Swan and Richard Swan. The machine won both Series 3 and 4. I’m not surprised that you removed the pullback motor. It is so annoying when you try to make the robots go when they are battling. It is only good for giving it the right weight and protecting the insides. Does anybody else find the pullback motor annoying? Wasn’t this everyone’s first toy from the RW line? @RobotWarsTim yeah well i still am but when the show was on i was mental for it – i taped every episode i made cardboard models of the robots etc… but now its off air and im older so idont really do that anymore! But i still make rw videos of all the rw toys i kept over the years for youtube so i guess i am still a big fan! You said that you USED to be a Robot Wars fan, I take it that it was just the way that you worded it. After my Chaos 2 Pullback’s flipper stopped working, I just took out the mechanism for it and now do it manually where it’s now flush with the ground and it’s more accurate. Good review, Chaos 2’s my favourite robot. ah yes. 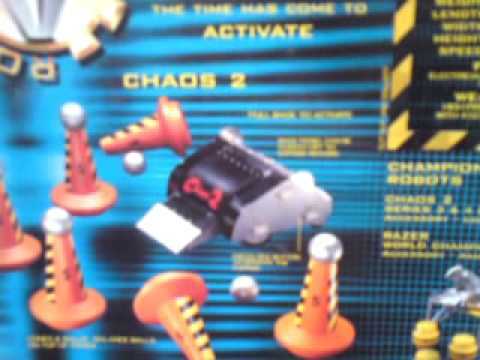 Chaos 2 was virtually everyones first Robot Wars robot, and personally my first but i was jealous because at the time my cousin got the gaunlet plus shunt and matilda from the same shop! but i got my own gauntlet in 2007.